The weekend is here which means its time for some… tacos. Yes, tacos. But not just any tacos, we’re talking spicy pork tacos (tacos al pastor) with a special Small Axe Sauce to add that picante flavor that’ll make it just right. 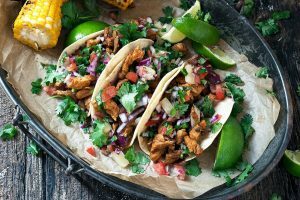 However, before we get to the recipe, have you ever thought about the origins of the taco, one of the most recognizable dishes in the world? Sure, you know its from Mexico, but do you kn ow anything else about this food truck favorite? Keep reading to learn more, then go enjoy some for yourselves with the delicious recipe we’ve left for you below! 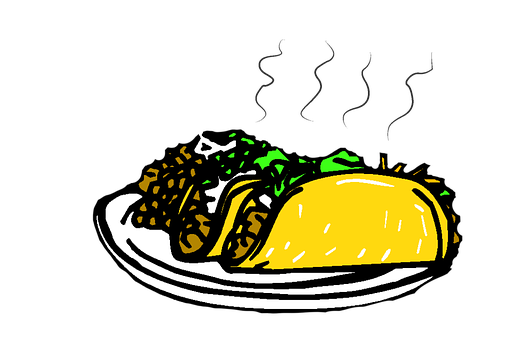 Like many other indigenous dishes, the taco predates the arrival of the Spanish in Mexico. The first anthropological evidence comes from the indigenous people living in the lake region of the Valley of Mexico, who traditionally ate tacos filled with small fish. The writing is from the Spanish conquistador, Bernal Díaz del Castillo, who documented the first taco feast enjoyed by Europeans, a meal which Hernán Cortés arranged for his captains in Coyoacán. Slice the pork shoulder into about 1-centimeter (¼ in) slices, then transfer to a large dish or bowl. In a medium bowl, combine the achiote paste, chili powder, garlic powder, oregano, cumin, salt, pepper, vinegar, and pineapple juice, mashing and stirring until smooth with no lumps. Pour the marinade over the pork slices, then toss to make sure they are coated on all sides. Cover the bowl with plastic wrap, then refrigerate for at least 2 hours or up to 3 days. Preheat the oven to 350°F (180°C). Line a baking sheet with parchment paper or aluminum foil. Place a slice or two of the pineapple on the baking sheet. Take a wooden skewer and push it directly in the middle of the pineapple. Remove the pork from the fridge and push the slices through the skewer, layering one after the other until there is a 1-inch (2 ½ cm) gap at the top. Push another pineapple slice on top. Bake for about 1½ hours, until the pork is slightly charred on the outside and deep red. Rest the meat for about 10 minutes, then carve off thin slices of pork and roasted pineapple. To assemble, place some pork on the tortillas, followed by a few pieces of pineapple, a sprinkling of onion, a pinch of cilantro, and a spoonful of salsa, and some diced avocado. Serve with lime wedges. With the chunky consistency of a spicy salsa verde, The Bronx Green Hot Sauce is made using 6 all natural ingredients. It is sweet and savory because of the apple cider vinegar, with a garlic-forward flavor, and a serrano level of spice.